Facebook users found that their accounts had been temporarily suspended Sunday night. Twitter was going wild with people from around the world complaining about the problem. This demonstrates how powerful of a service Facebook is. Facebook users around the world have been finding their accounts temporarily suspended at around 8pm Sunday PST. Within minutes, people who were locked out of their accounts flocked to Twitter to sound off on the matter. Not all accounts were affected, but there were enough to create quite a stir for its users. According to Gina Smith at aNewDomain.net — the website downrightnow.com has confirmed the problem existed for two hours. Facebook had no comment about the problem at the time of this writing. If this was a hack, now would be the perfect time to change your Facebook password. Or if you’re sick of Facebook in general — delete your account permanently. what’s going on with Facebook!!!!! how come there’s nothing online. Not even trending on twitter. However, do a #facebook on twitter and OH MY! Isn’t this huge or is it just me? @Cindy…it’s not just you. If you do a #Facebook you will see people complaining about it globally. A few of my friends here in the US have been affected, but some haven’t. We’ll keep our eye on this developing story. 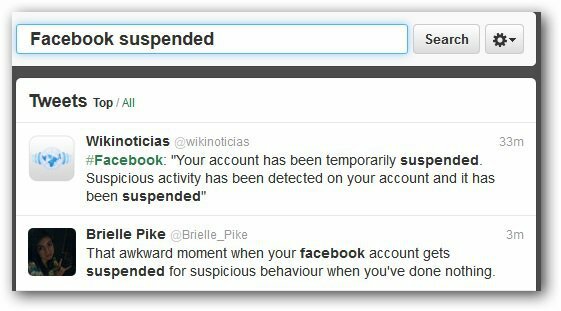 You advise to change my FB password, but how do I do that if my account has been suspended? I CANNOT LOG IN TO FACEBOOK! !